Gemini 3 was the first crewed mission in NASA's Gemini program. On March 23, 1965, astronauts Gus Grissom and John Young flew three low Earth orbits in their spacecraft, which they nicknamed Molly Brown. This was the ninth crewed US spaceflight (including two X-15 flights over 100 kilometers), and the 17th world human spaceflight including eight Soviet flights. It was also the final crewed flight controlled from Cape Kennedy Air Force Station in Florida, before mission control functions were shifted to a new control center located at the newly opened Manned Spacecraft Center in Houston, Texas. The crew of Gemini 3 was changed after Shepard was grounded with an inner ear disorder in late 1964. The mission's primary goal was to test the new, maneuverable Gemini spacecraft. In space, the crew fired thrusters to change the shape of their orbit, shift their orbital plane slightly, and drop to a lower altitude. 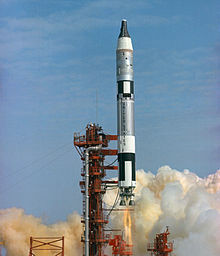 Other firsts were achieved on Gemini 3: two people flew aboard an American spacecraft (the Soviet Union launched a three-man crew on Voskhod 1 in 1964 and a two-man crew just a few days earlier on Voskhod 2, upstaging the two-man Gemini and three-man Apollo programs), and the first crewed reentry where the spacecraft was able to produce lift to change its touchdown point. 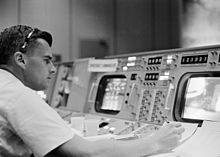 On March 23, 1965 at 15:57:00 UTC, at the end of the first orbit, over Corpus Christi, Texas, a 1-minute 14 second burn of the Orbit Attitude and Maneuvering System (OAMS) engines gave a reverse delta-V of 15.5 meters (51 ft) per second, which changed the orbit from 161.2 by 224.2 kilometers (87.0 by 121.1 nautical miles) (with a period of 88.3 minutes), to an orbit of 158 by 169 kilometers (85 by 91 nmi) (period of 87.8 minutes). This was the first orbital maneuver made by any crewed spacecraft. Gus Grissom, hoping to avoid duplication of the experience with his Mercury flight Liberty Bell 7 in which the capsule sank after splashdown, named the Gemini 3 spacecraft Molly Brown, in a playful reference to the Broadway musical The Unsinkable Molly Brown. NASA management did not like this name, and asked him to change it. Grissom replied, "How about the Titanic?". The managers relented and allowed Grissom to keep Molly Brown, but this was the last Gemini flight they allowed the astronauts to name. The only major incident during the orbital phase involved a contraband corned beef sandwich that Young had smuggled on board, hiding it in a pocket of his spacesuit (though Director of Flight Crew Operations Deke Slayton wrote in his autobiography that he gave Young permission to do so). Grissom found this to be highly amusing, saying later, "After the flight our superiors at NASA let us know in no uncertain terms that non-man-rated corned beef sandwiches were out for future space missions. But John's deadpan offer of this strictly non-regulation goodie remains one of the highlights of our flight for me." The crewmen each took a few bites before the sandwich was restowed. The crumbs it released could have wreaked havoc with the craft's electronics, so the crewmen were reprimanded when they returned to Earth. Other crews were warned not to pull the same type of stunt. Two small failures occurred in-flight. The first was an experiment testing the synergistic effect of zero gravity on sea urchin eggs. A lever essential to the experiment broke off when pulled. The second involved the photographic coverage objective. It was only partially successful due to an improper lens setting on the 16 mm camera. 00 18 41 (Command Pilot) I seem to have a leak. There must be a leak in one of the thrusters, because I get a continuous yaw left. 00 18 53 (CapCom) Roger. Understand that you get a continuous yaw left. 00 18 57 (Command Pilot) Very slight. Very slow drift. First attributed to a stuck thruster, the problem was traced to a venting water boiler. The crewmen made their first orbit change an hour and a half into the flight. The burn lasted 75 seconds and moved them from a 122-by-175-kilometer (66-by-94-nautical-mile) orbit to a nearly circular one with a drop in speed of 15 meters per second. The second burn, changing the orbital inclination by 0.02 degrees, was made 45 minutes later. The last burn, during the third orbit, lowered the perigee to 72 kilometers (39 nmi). This was made so, in case the retrorockets had failed, the spacecraft would still have reentered the atmosphere. The experience of reentry initially matched expectations, with even the color and pattern of the plasma sheath that enveloped the capsule matching those produced for ground simulations. However, it soon became clear that Molly Brown was off course and would land 69 kilometers (37 nautical miles) off target. Though wind tunnel studies had suggested the spacecraft could maneuver to make up for the discrepancy, Gemini's real lift was far less than predicted, and Grissom was unable to significantly adjust course. Molly Brown ultimately landed 84 kilometers (45 nautical miles) short of its intended splashdown point. This was not the only unexpected event of the short descent: After its parachutes were deployed, the spacecraft shifted from a vertical to horizontal attitude. The change was so sudden that Grissom cracked his faceplate (made of acrylic) on the control panel in front of him. Later Gemini spacesuits and all Apollo and Space Shuttle (both launch-entry and EVA suits) used polycarbonate plastic. A U.S. Coast Guard HH-52A over the Gemini 3 capsule. 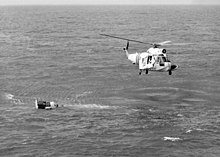 Upon landing, the astronauts decided to stay in the capsule, not wanting to open the hatch before the arrival of the recovery ship. The crew spent an uncomfortable half-hour in a spacecraft not designed to be a boat. Due to unexpected smoke from the thrusters, the astronauts decided to deviate from the post landing checklist and to keep their helmets on with the face plates closed for some time after splashdown. USS Intrepid recovered the craft and crew. The Gemini III mission was supported by the following United States Department of Defense resources: 10,185 personnel, 126 aircraft and 27 ships. The mission insignia was not worn by the flight crew as a patch, like those from Gemini 5 onwards. The Gemini 3 The Molly Brown emblem was designed and minted on gold-plated, sterling silver, 1-inch (25-mm) medallions. The crew carried a number of these medallions into space to give to their families and friends. The same design was printed on the cover of Grissom's book Gemini! : A Personal Account of Man's Venture Into Space. Young was seen wearing the emblem as a patch, produced post-flight, on his flightsuit as late as 1981. The spacecraft is on display within the Grissom Memorial of Spring Mill State Park, two miles east of Grissom's hometown of Mitchell, Indiana. ^ a b "Gemini 3 (3)". Kennedy Space Center: Science, Technology, and Engineering. August 25, 2000. Retrieved September 20, 2016. ^ "NASA History: Detailed Biographies of Apollo I Crew - Gus Grissom". NASA. Retrieved January 20, 2009. ^ a b "Gemini III radio transcript on Spacelog". National Astronaut and Space Administration. April 1965. Retrieved 2011-05-01. ^ French, Francis and Burgess, Colin. "In the Shadow of the Moon". University of Nebraska Press, 2007, p. 11. ^ Hacker, Barton; Grimwood, James (1966). On the Shoulders of Titans. Washington D.C.: NASA. p. 236. 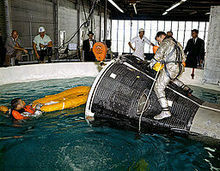 Wikimedia Commons has media related to Gemini 3. This page was last edited on 10 March 2019, at 15:01 (UTC).